On a chilly but sunny afternoon in Eugene, the Oregon State Beavers came calling and gave the Oregon Ducks a game like no one was expecting. 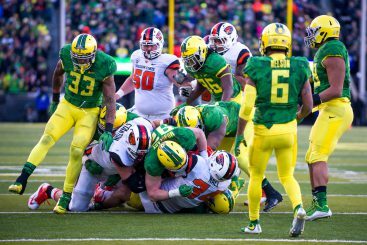 The Beavers, who went into Autzen Stadium 34 point underdogs while looking for their first conference win in their last game of the season, fought the Ducks for every point the teams scored and whittled the lead down to three points in the last quarter before losing, 52-42. 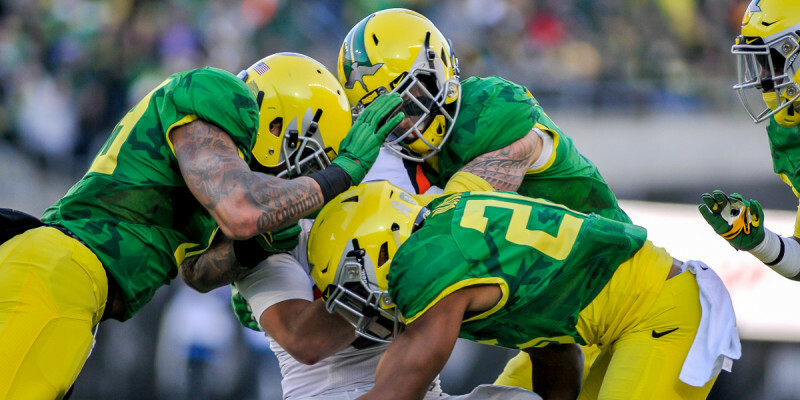 Oregon Ducks meet Oregon State Beavers in the 2015 football Civil War. The Beavers started the game off with a touchdown on their first drive before letting the Ducks score 31 unanswered points before halftime. 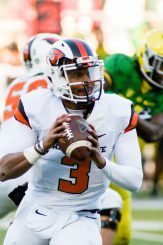 Just as it was starting to look like the game was going to be an easy Oregon win, OSU QB Seth Collins scored a one-yard rushing touchdown to give the Beavers their first points since the first few minutes of the game. 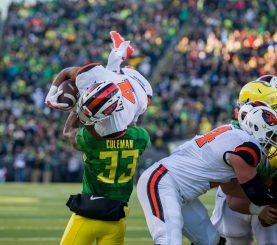 After an unsuccessful Oregon drive, Collins ran in another Beaver touchdown bringing the Beavers within 10 points, 31-21. Levonte Barnett said that having Collins back “gave us a spark and put the (Oregon defense) on it’s toes.” In the last few seconds of the third quarter, Oregon RB Royce Freeman ran in a touchdown bringing the score to 38-21. The Ducks didn’t let the three point differential stand for long as Vernon Adams Jr. connected with Bralon Addison for a four-yard touchdown pass bringing the score to 45-35. On the second play of the next Beaver drive, Nall saw a hole and took off for a 68-yard touchdown run, turning it once again into a three point game. Oregon responded with another Adams-to-Addison 24-yard touchdown pass before the Oregon defense helped end the game with the final 52-42 score. “Two good teams battled out. It was a offensive shootout,” said coach Andersen in a summation of the game.